Following in the wake of Hurricane Irma and last year’s active hurricane season, our “wetter than usual” summer rainy season has revealed more extensive water intrusion problems for many properties. 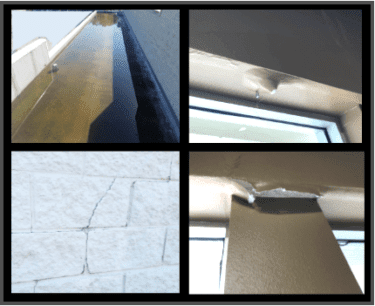 Unfortunately, many properties are discovering that these water leaks are indicating the breakdown of entire building joints and joint systems. When joint systems fail, they require complete re-caulking – removing old caulk which has deteriorated and replacing it with quality, manufacturer-recommended products. The most common water leak repair calls that A1 Orange answers are for water intrusion due to the breakdown of joints surrounding the glass. Sometimes, the water may intrude through cracks in building walls made of brick, stone, or other porous materials and may include failure of the mortar between the bricks or stones. If water is allowed to penetrate porous stone or wall materials, it weakens the stone and causes damage to the drywall and sometimes mold. At a recent leak repair call, A1 was asked to determine the source of extensive interior wall and ceiling water damage. One problem identified immediately was the leaf-clogged, sub-roof drains, which blocked the path for water to leave. There were long stretches of standing water in the sub-roof, which eventually found a way down through the ceilings and walls. It was also discovered that walls running between the sub-roof and roof had many cracked stones and failure of mortar joints between stones. In this case, cracks and deteriorated mortar must be repaired and the entire surface sealed with an elastomeric waterproofing coating. This coating leaves a pin-hole free surface which doesn’t allow water to penetrate. 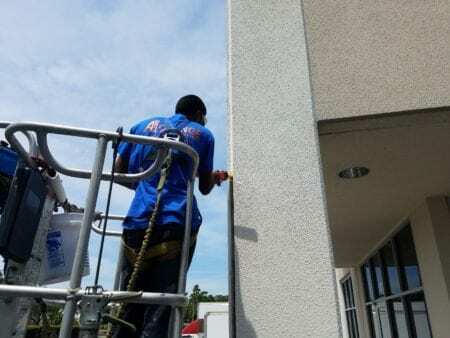 You can trust the waterproofing specialists at A1 Orange to find the water intrusion source and recommend the right solutions using the best products on the market. A1 Orange follows manufacturer guidelines when applying caulking or sealant and gets the manufacturer’s rep to certify the product warrantee. Learn more or contact A1 Orange for a waterproofing estimate. Budget season? Email or call us at (800) 874-6207 for a waterproofing capital project estimate.